The Reality Web Docs provide a complete reference for all features within its comprehensive database, development and operating environment. For features like the DataBasic Language and Objects, Web Services, XML, RealWeb, English, Proc, Spooler, Resilience and other Interoperability Interfaces you will find coding examples and how to use all features. Use the links below to browse complete indexed and searchable documentation, or download the zip file and install locally. To review when features were introduced in previous releases refer to the Feature Catch-Up Briefing page. Link to Revision 1 Update Notes. Although Windows Explorer can access Zip files most browsers will fail so unzip first. 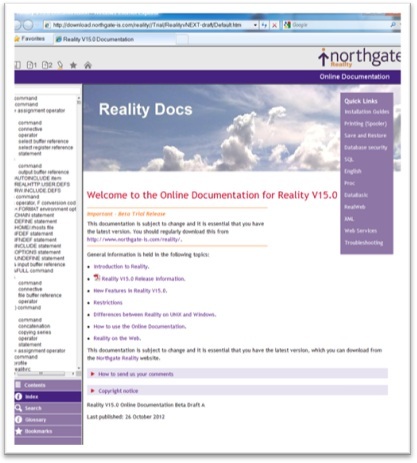 Refer to New Features in Reality V15.2 on the Docs Home page, using the link above. Consider adding the above browse link to your favourites, as it will always redirect to the latest published revision. Any references to V15.2 product folders and install paths should continue to use V15.1 instead. This will be corrected in the next Documentation published update. Link to Revision 7b Update Notes. For Windows run the Setup.exe to install, or for UNIX or Windows copy the Reality directory contents to drive:\Realman\html\Reality\Manuals, or where installed. Note: Serious issues with accessing content in some browsers means you may find issues with accessing pages. In this case please try another browser or use the V15 Documentation, as this clearly details new features for V15 and all other content will be relevant to V14.0 and have updated content. Refer to the Web Docs Home Page that includes How to use… to get the best from the Documentation, Quick Links to get you started and New Features in Reality… detailing new features within each new release. There are links on every page for you to pass comments back to us. The Documentation is also included as part of a 3-process free evaluation and demo product – refer to the Reality Evaluation Product page. This can be useful to help in the evaluation of features and for reference look up while using the product set.